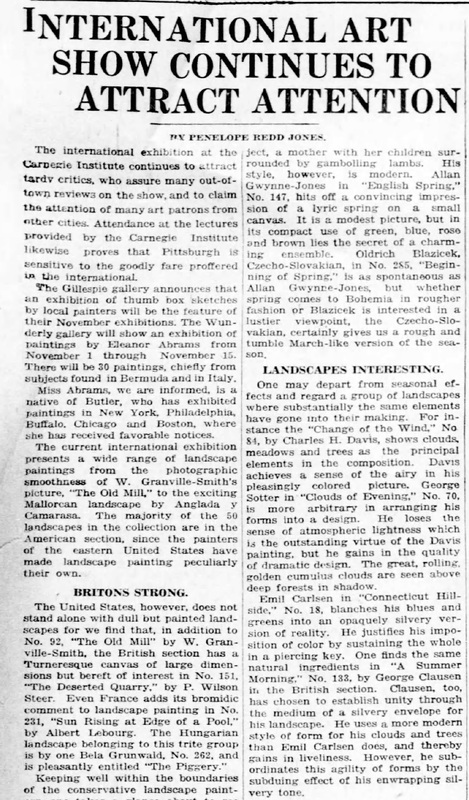 The international exhibition at the Carnegie Institute continues to attract tardy critics, who assure many out-of-town reviews on the show, and to claim the attention of many art patrons from other cities. Attendance at the lectures provided by the Carnegie Institute likewise proves that Pittsburgh is sensitive to the goodly fare proffered in the international. The Gillespie gallery announces that an exhibition of thumb box sktches by local painters will be the feature of their November exhibitions. The Wunderly gallery will show an exhibition of paintings by Eleanor Abrams from November 1 through November 15. There will be 30 paintings, chiefly from subjects found in Bermuda and in Italy. Miss Abrams, we are informed, is a native of Butler, who has exhibited paintings in New York, Philadelphia, Buffalo, Chicago and Boston, where she has received favorable notices. The current international exhibition presents a wide range of landscape paintings from the photographic smoothness of W. Grandville-Smith’s picture, The Old Mill, to the exciting Mallorcan landscape by Anglada y Camarasa. The majority of the 50 landscapes in the collection are in the American section, since the painters of the eastern United States have made landscape painting peculiarly their own. The United States, however, does not stand alone with dull but painted landscapes for we find that, in addition to No. 92, The Old Mill by W. Grandville-Smith, the British section has a Turnereque canvas of large dimensions but bereft of interest in No. 151, The Deserted Quarry, by P. Wilson Steer. Even France adds its bromidic comment to landscape painting in No. 231, Sun Rising at Edge of a Pool, by Albert Lebourg. The Hungarian landscape belonging to this trite group is by one Bela Grunwald, No. 262, and is pleasantly entitled The Piggery. Keeping well within the boundaries of the conservative landscape painting are taken along about to subject, a mother with her children surrounded by gambolling lambs. His style, however, is modern. Allan Gwynne-Jones in English Spring, No. 147, hits off a convincing impression of a lyric spring on a small canvas. It is a modest picture, but in its compact use of green, blue, rose and brown lies the secret of a charming ensemble. Oldrich Blazicek, Czecho-Slovakian, in No. 285, Beginning of Spring, is as spontaneous as Allan Gwaynne-Jones, but whether spring comes to Bohemia in rougher fashion or Blazicek is interested in a lustier viewpoint, the Czecho-Slovakian, certainly gives us a rough and tumble March-like version of the season. One may depart from seasonal effects and regard a group of landscapes where substantially the same elements have gone into their making. For instance the Change of the Wind, No. 84, by Charles H. Davis, shows clouds, meadows and trees as the principal elements in the composition. Davis achieves a sense of the airy in his pleasingly colored picture. George Sotter in Clouds of Evening, No. 70, is more arbitrary in arranging his forms into a design. He loses the sense of atmospheric lightness which is the outstanding virtue of the Davis painting, but he gains in the quality of dramatic design. The great, rolling, golden cumulus clouds are seen above deep forests in shadow.